The building with a tall smokestack, shown on the island near the left edge of the photo, is the Grand Rapids Gas Plant, often referred to as the Gas Works. The gas storage tanks are easily seen in the lower right foreground. Just above the storage tanks is a residential area, and plumes of smoke from factory smokestacks are visible. 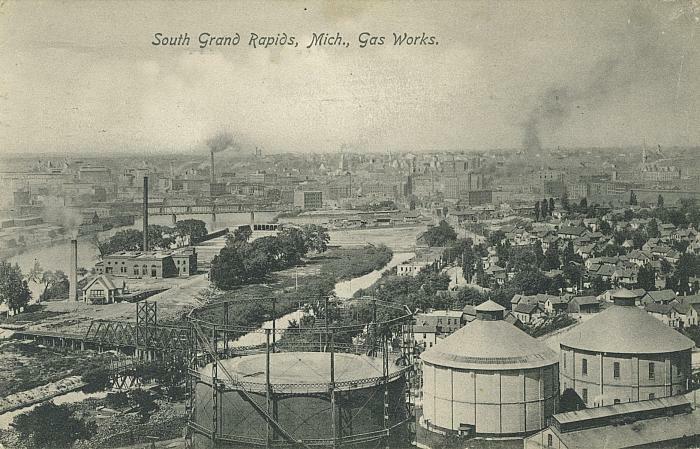 The postcard is labeled "South Grand Rapids, Mich., Gas Works." Title from document. The Gas Works was located at Wealthy and Oakland.